I just found out that Ronald Bard passed away in Asheville, North Carolina on March 3, 2018. His name may not be well known today, but in the late 1960s, he was the leading spokesman for the paper dress industry. Bard was part owner, of the company Mars of Asheville, along with his sister Audrey, and her husband Robert Bayer, who worked as an engineer at Scott Paper. Mars of Asheville was the first company to manufacture paper dresses as a commercial enterprise. Bard was quoted as saying that in 1966 he was convinced that disposable clothing would become half of the clothing market by 1980. However, the paper dress fad faded into history by 1970. I came across Bard’s obituary accidentally via a link from the Ramsey Library at the University of North Carolina. 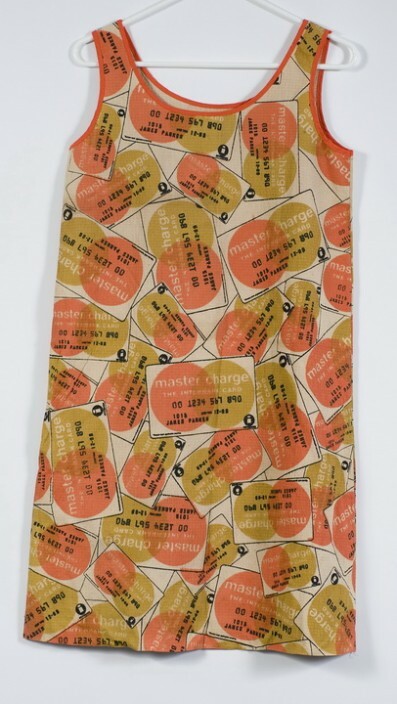 They have in their collection this Master Charge paper dress that was created by Mars of Asheville to advertise the launch of Master Charge in 1966 (renamed MasterCard in 1979). I thought I had seen all the paper dress prints ever made, but this one is new to me! This entry was posted in Fadshions and tagged 1960s, paper. Bookmark the permalink. The Ramsey library is in Asheville at UNC-A in case you feel the need to visit it next time you are here. I spent much of 4 years in that library! Sounds like they have a good archives of paper dress information!